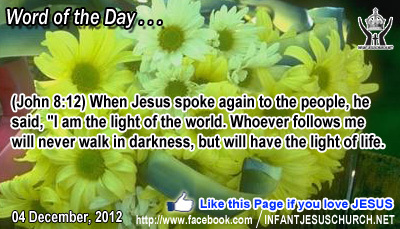 John 8:12: When Jesus spoke again to the people, he said,"I am the light of the world. Whoever follows me will never walk in darkness, but will have the light of life. Holy and Righteous Father, who lives in glorious and irrepressible light, we praise you for sending Jesus to cast away the dark fears that so easily surround us. We pray for strength and courage to not only live in the light, but show others their way to the light. In Infant Jesus' name we pray. Amen. 21In that same hour he rejoiced in the Holy Spirit and said, "I thank you, Father, Lord of heaven and earth, that you have hidden these things from the wise and understanding and revealed them to babes; yes, Father, for such was your gracious will. 22All things have been delivered to me by my Father; and no one knows who the Son is except the Father, or who the Father is except the Son and any one to whom the Son chooses to reveal him." 23Then turning to the disciples he said privately, "Blessed are the eyes which see what you see! 24For I tell you that many prophets and kings desired to see what you see, and did not see it, and to hear what you hear, and did not hear it." Jesus makes a claim which no one would have dared to make: He is the ideal revelation of God. Our knowledge of God is not just limited to knowing something about God - who he is and what he is like. We can know God personally and be united with him in a relationship of love, trust, and friendship. Jesus makes it promising for each of us to personally know God as our Father. To see Jesus is to see what God is like. In Jesus we see just right the love of God – a God who cares powerfully and who yearns over men and women, loving them to the point of laying down his life for them upon the cross. Do we pray to your Father in heaven with joy and self-confidence in his love and care for you? Loving Infant Jesus, give us the child-like simplicity and purity of faith to look upon your face with joy and confidence in your all-merciful love. Remove every doubt, fear, and proud thought which would delay us from receiving your word with trust and humble submission.